CMHA honors the officers who have lost their lives from the lines of duty in a memorial called The Greater Cleveland Peace Officers Memorial. Located at the corner of West 3rd St. and Lakeside Ave in downtown Cleveland in the historic Huntington Park, the memorial was dedicated on May 14, 1993. The site once housed Fort Huntington, built to defend Cleveland during the War of 1812, and it is only fitting that now it serves to both honor those who continue to protect, and those who have died protecting our lives and property. Each May, the Society sponsors the Greater Cleveland Peace Officers Memorial Celebration in conjunction with National Police Week and Peace Officers Memorial Day. Events include a parade through downtown Cleveland followed by a service at the memorial. Constructed of black polished granite, the memorial occupies almost 1,000 square feet. The structure consists of a curved wall that slopes gently from two feet high upward to six feet semi-surrounding three granite tablets. The three tablets inside the curved wall measure seven feet wide, 12 feet high and two feet thick and e ach bears the name, law enforcement agency, and date of death of each of the 172 area peace officers who have died in the line of duty. One of the premier events is the Greater Cleveland Peace Officers Memorial Tattoo. In the time-honored tradition of the military tattoo, the pipes & drums of numerous police departments throughout the United States and Canada, as well as marching bands, drill teams, dance and choral groups, combine their talents in a spectacular display of pageantry and music. The law enforcement community and the general public gather together in remembrance, fellowship and celebration to indeed "Honor our Fallen". 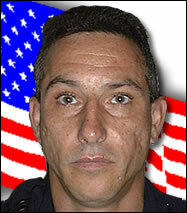 Officer Derrik Lanier was working a part-time job when he was shot in the back and killed on March 22, 1996. Officer Lanier, in full uniform refused the suspect admission to a tavern earlier in the evening. The suspect returned around closing time and without warning shot and killed Officer Lanier. The suspect fled and was arrested later that morning with an accomplice. The weapon was also recovered. Officer Lanier began his law enforcement career with CMHA in 1992 and had received public recognition for his work with disadvantaged youth. CMHA Police Officer Edward Madison died in an automobile accident on August 15, 1994. At the time of the accident, he was off-duty and driving his motorcycle westbound on St. Clair Avenue and in the vicinity of East 124th Street. Emergency medical services and police including Cleveland and CMHA Police Officers arriving at the scene observed he was carrying his CMHA badge, police hat, and firearm at the time of the collision. He received a funeral and burial with police honors. On Friday afternoon, October 14, 1989, a 31 year-old male confronted and disarmed Officer Alcee McCray at gunpoint. Officer McCray had been making his rounds on the first floor of a CMHA Hi-rise building when the male accosted him. Officer McCray was shot and fatally wounded during the confrontation. After shooting McCray, the suspect shot another officer in the face as he arrived on scene. The suspect fled with Officer McCray’s firearm and ran toward Franklin Avenue. Eventually, he lost the stolen firearm as he climbed over a fence. He was apprehended a short time later. Officer McCray’s killer was found guilty of aggravated murder and sentenced to 38 years to life plus 25 years for the death of Officer McCray. Alcee McCray’s name is inscribed on the National Law Enforcement Officers Memorial Wall in Washington D. C.
On February 11, 2003, Officer Eric Nar reported to work, attended Roll Call, and started his tour of duty patrolling the various CMHA properties. When Officer Nar failed to respond to Dispatcher's radio calls for service, officers immediately began a search to find him. CMHA Police Officers spotted Officers Nar’s patrol vehicle parked with the engine running near the intersection of Woodland Avenue and E. 55th Street. He was found inside the vehicle disoriented and complaining of a severe headache. Officers rushed him to the nearest hospital where he was admitted. Soon thereafter, Officer Nar lapsed into a coma. He died several days later. Doctors determined that his untimely death was the result of a brain aneurysm.